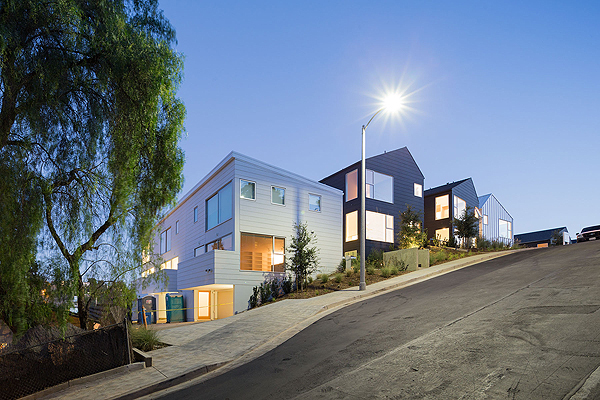 Blackbirds by Barbara Bestor is a cluster of 18 homes nestled in the bohemian hills of Los Angeles’ Echo Park neighborhood. 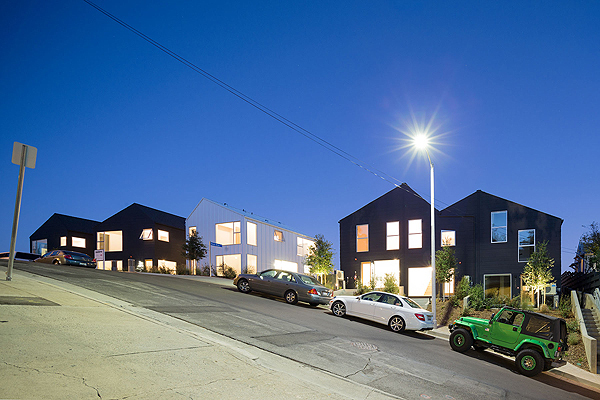 Blackbirds is a progressive design solution for high quality dense housing in a city with little available land. 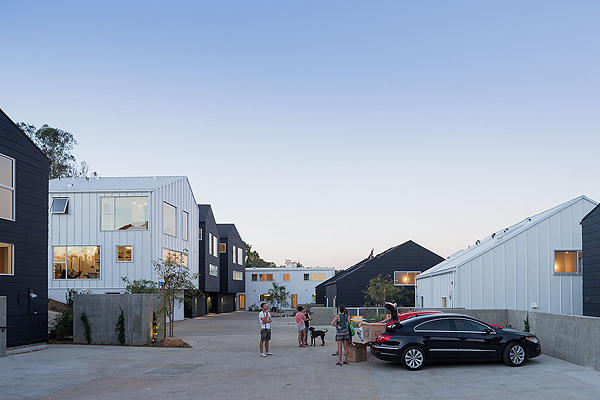 The houses are under 1,920 square feet and are built around a living street: a central courtyard that comprises both landscape and parking areas, as well as serving as the stage for larger community functions and play. 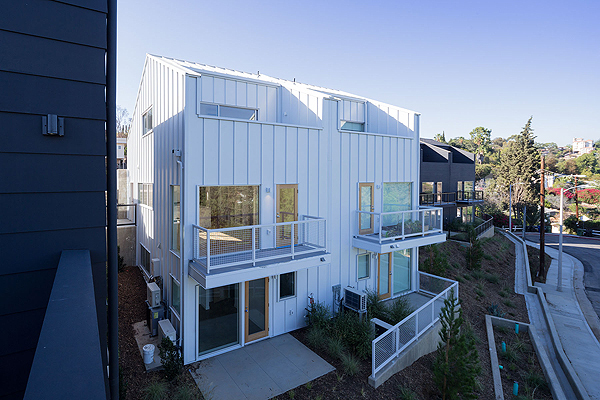 Blackbirds is an experimental contemporary urban living where community, nature, and design are in balance with each other. The placement of the houses in the hills mimics the early 20th century craftsman cabins of the area, and deploys a sleight of hand, combining several houses into a single house shaped volume. This conceals the actual density of units by maintaining the neighborhood shape and landscape context across the .82 acre site. The 18 houses are situated in a drought tolerant landscape with mature trees that is woven into the surrounding neighborhood fabric. 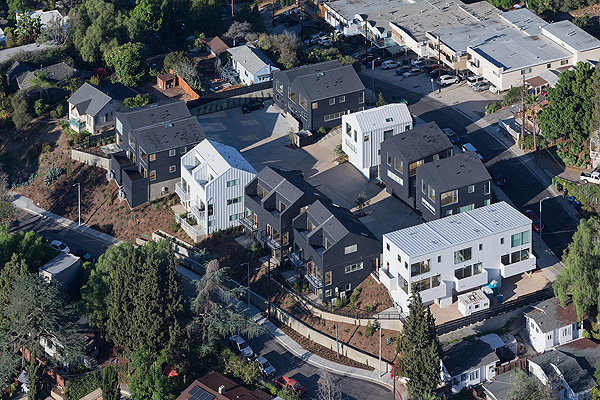 The Blackbirds community is a thoughtful blend of private, semi-private and public space, and promotes connections with neighbors and the community. The emphasis of the design is on a higher quality of life within an urban context by promoting interactions between neighbors, links between units with native landscaping, and medium density with sensitive scale and massing. Bestor Architecture is an architectural practice dedicated to finding transformative design opportunities in daily life experience. Barbara Bestor developed a varied and progressive body of work over the last fifteen years that engages, amuses and communicates with people on many levels, often outside the boundaries traditionally delineated for architecture. 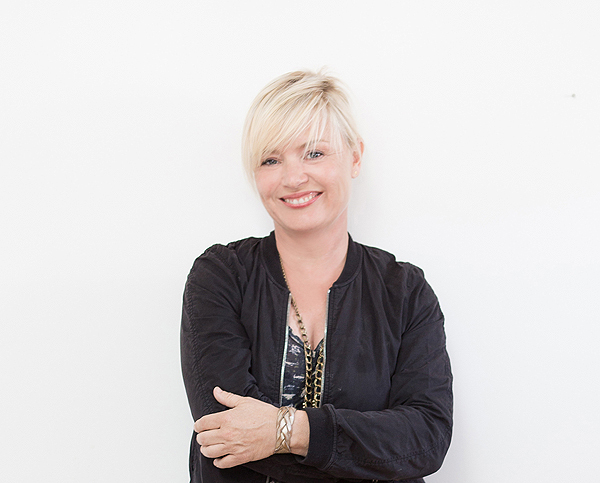 She has completed numerous influential public spaces, design installations and commercial establishments as well as a book on design and community, “Bohemian Modern.” The office is dedicated to expanding architecture through culture, reclaiming the larger territory of design to bolster its architecture’s ability to communicate.